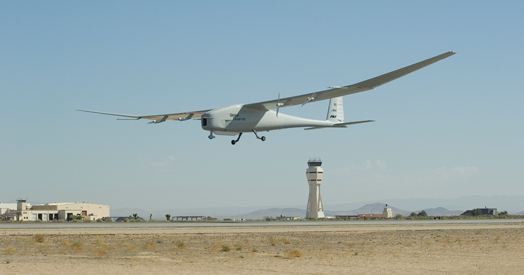 HALE UAS - AeroVironment, Inc. In 1998, Pathfinder was upgraded to become the Pathfinder Plus, with a new center wing panel, which increased the wingspan to 121 feet. New high-efficiency solar cells were fitted and many other improvements made, before making a maiden flight in June. 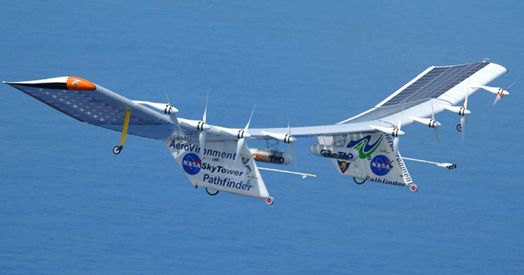 On August 6, 1998, Pathfinder Plus met its intended goal by flying to a record 80,201 feet from PMRF Barking Sands, Kauai, higher than any other previous propeller-driven aircraft. The Pathfinder Plus was flown on telecommunication missions in June 2002, and again for aerial surveillance of coffee crops in September. Later in 2002, Pathfinder Plus performed the world’s first telecom demonstrations from 65,000 feet (20km), including high-definition television (HDTV) broadcasts, third-generation (3G) mobile voice, video, and data relays using an off-the-shelf mobile handset, and high speed internet connection. Most recently, Pathfinder Plus was flown at Edwards AFB to perform atmospheric turbulence measurements in August and September 2005, before being retired from flight service. Benefiting from lessons of the Centurion HALE UAS, the wingspan was extended to 247 feet, and the aircraft was renamed the Helios prototype. Initial low altitude flight testing was completed successfully under battery power at Edwards Air Force Base in 1999. 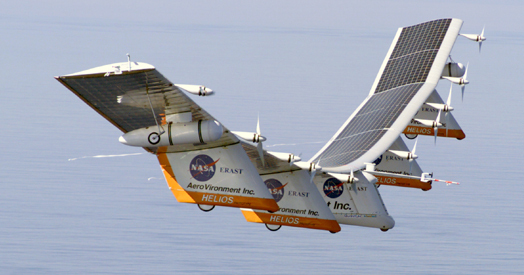 Helios was then equipped with high-efficiency photovoltaic solar cells and performed high-altitude flight testing in the summer of 2001 at the U.S. Navy Pacific Missile Range Facility (PMRF) in Kauai, Hawaii. On August 13, 2001, during its second high-altitude flight, Helios reached 96,863 feet, shattering the existing world altitude record for sustained level flight for both propeller and jet-powered aircraft (the SR-71A spy plane was the previous record holder, having flown to 85,068 feet in July 1976). This historic milestone, reaching well above the planned operational altitude of 65,000 feet, further demonstrated the viability of AeroVironment’s concept for stratospheric platform technology in support of government and commercial applications. The Helios prototype was the precursor to the Global Observer Stratospheric Persistent UAS. Larger and more robust than the Pathfinder predecessors, Centurion incorporated many of the enabling technologies for an updated HALE UAV, able to perform atmospheric satellite missions. A quarter scale model was used to verify design predictions before advancing to fabrication of the full-scale UAV. Designed to be able to carry up to 600 pounds of payloads to approximately 80,000 feet, the 206 feet span Centurion was prepared as a test vehicle for a series of low altitude tests at NASA Dryden in the fall of 1998. Energy storage was limited to battery power and no solar array was yet fitted at this stage of development. 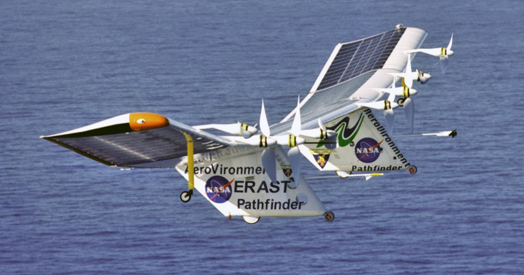 Inspired by the possibilities of their earlier manned solar-powered aircraft, AV first began developing a solar-powered HALE UAV in 1981 to provide a continuous high altitude platform. After making 9 successful test flights, the 99 ft wingspan Pathfinder was mothballed for a decade because of technology limits in the propulsion system at that time. 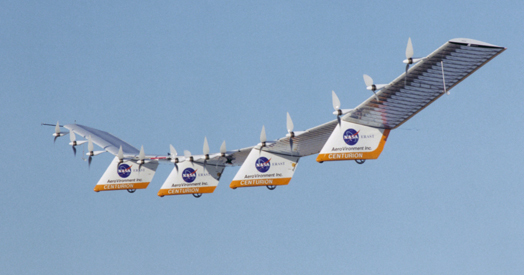 The Pathfinder aircraft was then adopted by NASA’s Environmental Research Aircraft and Sensor Technology (ERAST) program in 1994, to assist in the development of research platforms for the Stratosphere. Pathfinder flew to 50,567 feet at Edwards September 12, 1995, its first trip to the stratosphere. From there, it was improved and taken to the Pacific Missile Range Facility (PMRF), Kauai, Hawaii for test flights in 1997, where it flew to 71,504 feet on July 7, before performing a series of science missions over the Hawaiian Islands. The Global Observer is a High Altitude Long Endurance (HALE) unmanned aircraft system. It combines the best attributes of satellites and both manned and unmanned aircraft. From the stratosphere, the Global Observer will act like a mobile, 12-mile-high tower, covering an area of up to 600 miles in diameter. Many missions are enabled by such a high vantage point. Every GO component is designed for maximum flexibility and flight endurance – 3 to 4 times that of any other fixed wing aircraft. A revolutionary liquid hydrogen-fueled propulsion system, coupled with an extremely light, but durable airframe, enable significant benefits and capabilities never thought possible.